Bought myself a $29 T-shirt today. 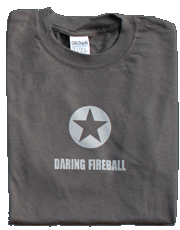 Actually, it’s a T-shirt and one year of sponsorship for Daring Fireball. Figured that since John Gruber is about the only Mac commentator who’s actually worth reading, and since he had the cojones to quit his day job to produce the site full-time, the man should be encouraged. Daring Fireball is kind of like NPR in that it provides an oasis of sanity in a waste land of gibbering monkeys, and so just like NPR, it’s worth paying to keep it going. And let’s face it, anybody who can make you laugh out loud reading about the woes of an anthropomorphized brushed metal interface deserves some cold, hard cash.